Rory McIlroy spent a fortnight in the air flying to and from tournaments in the past year, touching down at nearly 120 airports along the way. Although this is time usually spent in the most cosseted of cabins, it also explains why he has no problem with Paul Casey potentially turning his back on the Ryder Cup. Indeed, McIlroy admits that he has considered following the Englishman's example and resigning from the European Tour to help make his schedule easier to manage. "I've definitely contemplated it," the 26-year-old told BBC Sport. "You know, getting sick of the travel, getting sick of having to cross back and forth between tours. "The players on the European Tour have had endless dialogue about reducing the number of tournaments that you need to play." 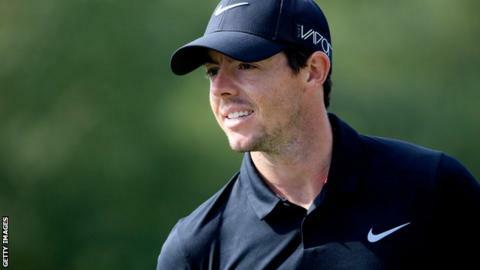 Players are required to compete in at least 13 events a year to retain their European Tour membership and remain in the Race to Dubai, although McIlroy has been given special dispensation this year because of an ankle injury suffered in July, meaning he will play 12. Only European Tour golfers are eligible to play for the continent in the Ryder Cup and Casey, who has a one-year-old son and lives in the United States, will sacrifice a probable place at Hazeltine next year if he does not renew the membership he gave up in January. "Some things matter more to people than others and I'd say family would always come first before any golf tournament, no matter what it is," McIlroy said. "So if that's Paul's decision more power to him for doing that. The way he's playing it would be a bit of a blow for the European Ryder Cup team. "But I feel like we've got enough strength in depth that even if Paul isn't on the team we'd still be able field a really strong 12 guys." McIlroy, however, does not envisage turning his back on the European Tour. "Have I contemplated it? Yes, I have. Would I do it? Probably not," he said. "I feel like I owe a lot to the European Tour, they gave me a lot of opportunities at the start of my career. I will always be grateful for that. "I love the Ryder Cup, I always want to play it, so that's something that'll keep me a European Tour member, along with a lot of the great plans they've got." McIlroy has already been in conversation with the new man in charge of the Wentworth-based European Tour. "I had a long chat with Keith Pelley this week," the four-time major champion revealed, "about some of the plans and some of the ideas that they have going forward and they're very exciting and very promising. Stuff like that I would be excited to be part of." Nevertheless, figures released this week detailing McIlroy's travel and golfing commitments offer an interesting insight into the world number three's lifestyle. They reveal that in the last 12 months the Northern Irishman has hit 16,500 balls in training and competition, performed 6,800 press-ups, signed more than 6,000 autographs and walked 932 miles around golf courses. But it is the statistics that detail the extent of his travel that most catch his eye. "There's a lot of not sleeping in my own bed, but that's the life of a professional golfer these days," he said. "One hundred and eighteen different airports in a year - that's a lot. I didn't even realise I went to that many places in one year. I think it was 287 nights in a hotel room. It's a lot. "But it just shows the world has become so small these days, playing different tours and having commitments either side of the Atlantic. It all adds up." The one journey to really disappoint McIlroy this year has been his downward travel in the world rankings, slipping from the top spot to trail both Jordan Spieth and Jason Day. He has described their major-winning performances as inspiring and motivating and is now looking to acquire some of the qualities that set Spieth apart in 2015. The 22-year-old Texan won the Masters and the US Open among five victories, culminating in his recent triumph at the Tour Championship in Atlanta. that also secured the lucrative FedEx Cup title. "Jordan, more so than Jason and myself, can out-think golf courses," McIlroy said. "That's his real strength. "At the Tour Championship he didn't have his best stuff but he was able to grind it out. That's the real mark of a champion, being able to win without having your best game. "He has got a lot of mental toughness. Jason and I can overpower golf courses and do it that way. "It would be nice to get a little bit of Jordan's sort of mental fortitude and be able to win tournaments that way too." McIlroy admits that, despite all his globe-trotting, 2015 has been "a lost year" largely due to the ankle injury that has him vowing never again to play football with his mates midway through the golf season. The good news is that he retains a huge appetite to scrap it out at the top of the game and, perhaps most importantly of all, there's no danger of him being lost to the European Tour - or the Ryder Cup.